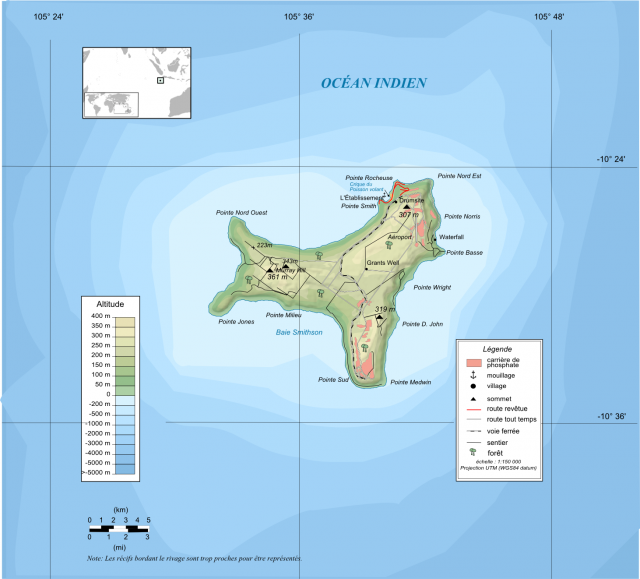 CHRISTMAS ISLAND IS AN isolated island in the INDIAN OCEAN, located about 220 mi (360 km) southwest of JAVA, INDONESIA, and 1,400 mi (2,300 km) northwest of AUSTRALIA, to which it belongs as a dependency. Maintained chiefly as a phosphate-mining colony since the 19th century, it is now being developed as a tropical island holiday spot and as a potential launching site for the Asia-Pacific Space Center. The island is the summit of a submarine mountain. About 60 million years ago a volcanic cone emerged, became covered in coral and limestone, and sank back into the sea, only to reemerge from tectonic uplifts about 10 million years ago. Coral reefs surround the crown of this peak. It is evident that this is the top of a mountain because there is virtually no continental shelf: the surrounding waters plummet to 1,650 ft (500 m) within 660 ft (200 m) of the shore. Sea cliffs up to 60 ft (20 m) rise straight from the sea toward a central plateau. There are a few shallow bays, the largest being the island’s only port, Flying Fish Cove, on the northeast corner. Most of the island is covered by tropical rainforest, which, since 1998, has been preserved as a national park. This park attracts visitors to its unique flora and fauna, notably the island’s most famous residents, the red crab: 100 million of them crowd the forest floors. The surrounding waters are known for their varied tropical fish, spinner dolphins, and the occasional whale shark. The island was noted in the logs of various British and Dutch explorers in the 17th century and given its name by one of these on Christmas Day, 1643. The uninhabited island was annexed by Great Britain in 1888, and some settlers arrived from the COCOS ISLANDS (560 mi or 900 km to the southwest) to collect timber and supplies. Phosphate mining began in the 1890s, with imported labor from Southeast Asia. Today’s Chinese and Malay populations are descendants of these workers and are the bulk of the island’s population. The island was administered as part of the Singapore Colony until 1957, when Australia bought it for £2.9 million. The mines closed in the 1980s, so Australia granted citizenship in 1984, giving its residents social services and emigration possibilities. The mine was bought by locals in 1991 and reopened on a smaller scale, but government- sponsored tourism is now the largest industry, including a casino.